When you think of New Orleans, fast isn’t the first word that comes to mind. After downing a few Hurricanes on Bourbon Street or binging on beignets at Cafe Du Monde, moving fast is the last thing you want to do. 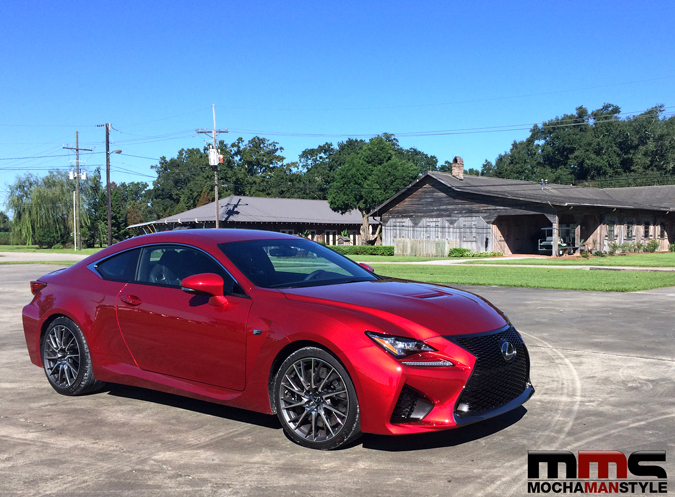 However, when you have a car like the new 2015 Lexus RC F, speed is the only thing you can think of even if you’re in the Big Easy. 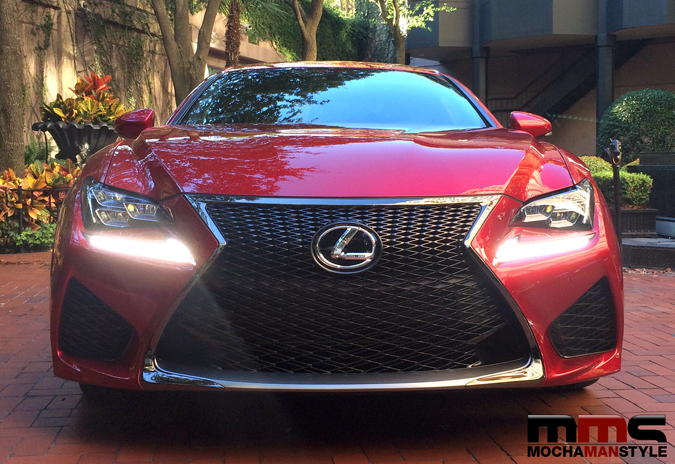 The Lexus RC F, the most powerful V8 performance vehicle ever produced by Lexus, is a stunning sports coupe. Not only does it boast a 467-horsepower 5.0- liter V8 engine, but it also features elegant design and strong curb appeal. The cars looks like a longer, wider, more squat version of the IS F that it is replacing in the Lexus line-up. The black mesh spindle grille gives the car a menacing look while deftly adding an elegant design cue by repeating the “F” motif in the mesh pattern. But these design features are more than just eye candy. Cooling ducts within the RC F grille supply air to oil coolers and a large L-shaped cooling outlet at the rear of the front fender, provides essential performance enhancements. The hood is raised in the center to accommodate and emphasize the V8, and a meshed vent in the center provide additional aerodynamic benefits. 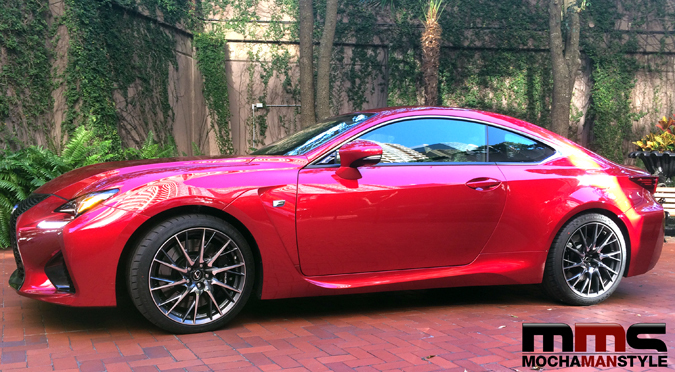 All of these features made me eager to drive the streets of New Orleans in the Lexus RC F. I stepped outside of my hotel to find several RC models waiting in the parking lot. I was immediately drawn to the Infrared (one of 7 unique exterior colors) RC F because sports cars always look best in red (This is a noted scientific fact, no need to use Google to verify. Just trust me on this). After doing a quick walk-around to admire the car, I got inside to discover an interior that was just as impressive as the exterior. I especially like the leather, racing inspired seats. Special integrated foaming construction helps the seats conform to your body and reduce fatigue. The high-back design with integrated headrests and side bolsters provides optimum support for the back in mid-g cornering and additional shoulder support in high-g driving. In other words, these seats keep you secure when floor it to see how fast the RC F can get from 0 to 60 (4.4 seconds, by the way) and when you take those curves doing 60. I also liked the RC F’s three-spoke steering wheel. Although it has a small diameter, it is thick and substantial with built-in finger rests for control and comfort. 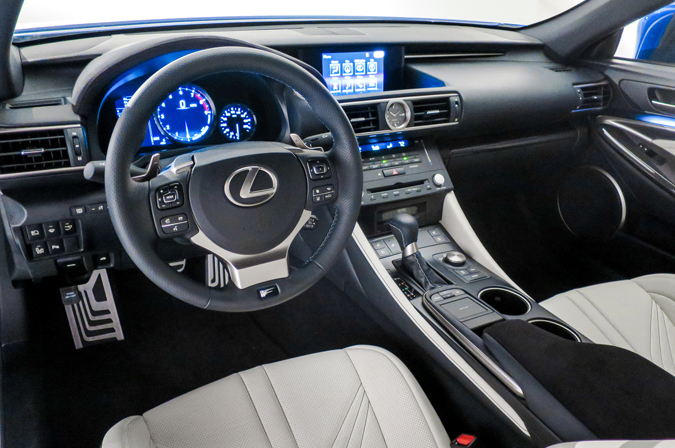 The large paddle shifters are easily accessible for those times when you want to place the RC F in manual mode. The cockpit is well-appointed with aluminum and black carbon fiber finishes to give it a sleek, upscale feel. The only thing I didn’t like about the interior is the touchpad controller in the center console that uses smartphone-like touch gestures — including tap, flick and pinch — to operate audio, navigation or system information displayed on the center screen. I understand that Lexus is trying to seamlessly integrate their vehicles with our mobile devices, but this touchpad isn’t as user-friendly as the specs describe. I found myself getting frustrated every time I had to use it (I had the same gripe when I test drove the Lexus NX F Sport). To be fair, I was only in the vehicle one day. Maybe the interface would become second nature after repeated use. I started off by driving through the French Quarter. It quickly became clear that these streets were better suited for stage coaches than for performance vehicles. I’m the type of guy who likes to feel the road when I drive, and I felt every nook and cranny of New Orleans’ streets. I decided to get out of the city and find roads that would give me a better impression of the RC F’s capabilities. I soon found myself headed west on Interstate 10. As soon as I entered the highway, I felt the RC F come alive. I frequent this stretch of highway between Houston and New Orleans and it’s always swarming with State Troopers. I knew that I wouldn’t have many chances to open up the car so I tested the acceleration in short bursts. With 389 lb.-ft. or torque at 4,800 – 5,600 rpm, the RC F gives you the power when you need it. After several minutes of driving, I noticed about of mile of clear road ahead of me and shifted the car into Sports S+ Mode. The car immediately transformed from a laid-back coupe, to an aggressive beast that was ready to devour the road. Within seconds, I was speeding past the century mark on the speedometer and the RC F was not showing any signs of backing down. In addition to increased driving performance, you get additional information on the panel when the car is in SPORT S+ mode. The dial indicator is replaced by a bar type tachometer, which makes engine RPM more easily visible. In addition to the vehicle speed and shift position, the meter display shows water temperature and oil temperature. The panel also offers G-force display and torque distribution display (for cars equipped with the Torque Vectoring Differential). With technology adopted from the LFA, a wing deploys from the RC F trunk lid at 50 mph to increase downforce as vehicle speed rises. As the vehicle’s speed drops below approximately 25 mph, the wing retracts. On my way back to the hotel, I found a winding back road to test the RC F’s handling. The combination of the RC F’s staggered wheel and tire setup (255/35R19 front and 275/35R19 rear tires), electric steering, Torsen Rear Differential, Torque Vectoring Differential (TVD), kept the car firmly planted to the ground as I zipped through curves and straight and steady when I floored it on straight-a-ways. It’s obvious that the Lexus RC F was built for car enthusiasts who feel as comfortable driving on the highway as they do on the track. From its footprint and body rigidity to its aerodynamics, suspension hardware, brakes, electric power-assisted steering calibration and chassis electronics, the 2015 Lexus RC F is a technological marvel that is built for performance. For more information on all of the models in the Lexus RC lineup, visit the Lexus website.